2Pock the squash flesh with the tip of a knife. On a roasting-tray lined with baking-parchment, place the squash cut-side up and the peppers cut-side down. 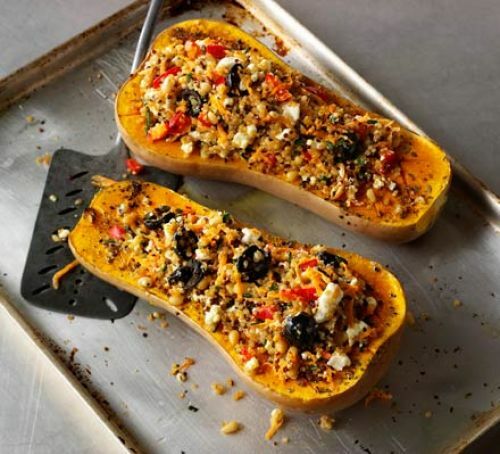 Brush with oil, season and bake for 35 to 40 minutes, until the squash are tender and the pepper skins well roasted. Leave to cool. 3Fry the onion in 1 tbsp of the olive oil for 10 minutes until soft and slightly caramelised. Add the chilli and cook for a minute. Add the tomatoes, garlic, vinegar and 100ml (3½fl oz) water. Cook for 10 minutes over a medium heat until slightly thickened. Add the peanut butter, cook for a few seconds until well blended, then turn off the heat. 4Turn down the oven to 180°C. 5Carve some of the flesh out of the butternut squash to extend the hole without damaging the skin. 6Peel and chop the peppers. Add to the tomato sauce along with the quinoa and mix. Divide the mixture between the squash shells. Dot the top with vegan feta cheese, drizzle with the rest of the olive oil and bake for 25 to 30 minutes, until the cheese is golden. Great with Sunday lunch trimmings & lots of vegan gravy!